Heat a dry, heavy-based frying pan until extremely hot. 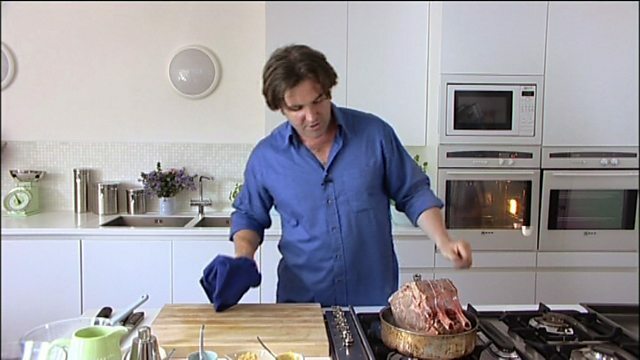 Rub the beef with the oil, season with salt and pepper and sear on both sides until you have a brown crust. Add the butter to the pan and baste the beef with the melted butter for 1-5 minutes, depending on how well-done you like your beef. Remove the beef from the pan and leave to rest for 10 minutes. For the dressing, combine all the ingredients in a saucepan and warm gently. Slice the beef into thin slices and pour over the dressing, then scatter over the cucumber pieces and the deep fried mint leaves. To finish, scrunch up the fresh mint leaves in your hand to release the aroma and scatter them over the beef.